It is that time of the year, when ever fashion loving denizen sets aside what she/he is presently doing and blog together for a common cause: The Award Season. Yes, my fellow fashion junkies, beginning of a New Year means one things: A whole new award season with a loads of fashion hits & misses!! For information we rely heavily on print, digital and social media to take us on our annual award season red carpet journey. Therefore blogging about events you did not attend is like second-hand blogging. All the inside information and juicy tidbit you hear or read belongs to someone else. Wondering how does one use all the existing information and turn it into their own creation without looking like a big copycat? Simple, keep these guidelines in mind while blogging about award shows and other red carpet fashion and very easily, you too can create your very own award season experience for your readers. The golden rule is to credit every outside source you have borrowed from. And the word is BORROW. Say with me "BORROW". The cardinal sin of blogging is to simply copy-paste others ideas or handiwork. That is a big NO-NO. Firstly, I don’t see why bloggers literally rush themselves into uploading pictures ASAP of the award show fashion right onto their blog. Seriously, stop doing that. Remember, whatever you upload has already been uploaded by mainstream media. From E! to Huffington Post to BBC and ever other tabloid magazine has it covered. The real question is, do you want to just post what has already been published over a 100 times already or do you want to present your own views? F.Y.I. by simply copying and pasting images you're not adding anything new! You started a blog so that you could voice your own opinion and views. Plus, your readers deserve better than someone else words and views. Give them more than that. My suggestion is to first do a good research, get the feel of the entire event; what trends stood out, what celebrity was at her stylish best ect… and then post it with your own twist and take. 3. Research From More Than One Source. Variety is the spice of life. Dig into as many reliable resources as you can. This way you get a better idea of the entire thing, plus it is good to have more than one viewpoint. But, at no time must you OD on research that you lose complete focus. I like to start with mainstream media biggies like Vogue and Style.com, followed by one or two international tabloids and finally a visit to some of my fave fashion blogs. Restrain is much needed while covering award show red carpet fashion. Oh! The desire to upload ever-stunning gown is so overwhelming that one gets easily carried away. While Style.com and People magazine can do that, you must not. Why you ask? One, it completely overloads the site, and two; your readers can get the basic details and coverage from larger publications. In these decision-making times, I rely heavily on my self-editing senses. Pick and choose the few ones that in your opinion were a clear standout-good or bad. Depending on the post theme: hits or misses, most popular trends, ect… choose 5 to 6 best looks and work with it. Exhibit A: “OMG, Actress X looked stunning in Designer Y’s pink gown” Do you see a problem with this. Seriously, if you are going to ONLY state the obvious them your post is informative-maybe, interesting-hell NO. Not only do you get to show-off your fashion knowledge, but you also get to channel your inner fashion critique. Award shows are a fashion bloggers wonderland. Don't stop yourself. Go all out and give your reader a piece they will recommend to everyone they know. However at no point should you body-shame an actor or actress. If an outfit is unflattering feel free to point that out, but do not, I repeat do not every body-shame anyone. 6. Know Your Fashion Lingo. Even if fashion is not your first language, one must acquaint themselves with basic fashion terminology. If you plan to cover fashion you must know its lingo! Get yourself acquainted with different silhouettes, hemlines, colours and fabrics. Also, please refrain from using the same adjectives again and again. There is only so many times you can use the word ‘chic’ to describe the same look! Most importantly, make sure the names of designers and celebrity is spelled correctly. You want to come across as credible and not careless. P.S: These same guidelines are applied for blogging about Fashion Week or any event you haven't had a chance to attend but wish to write about. 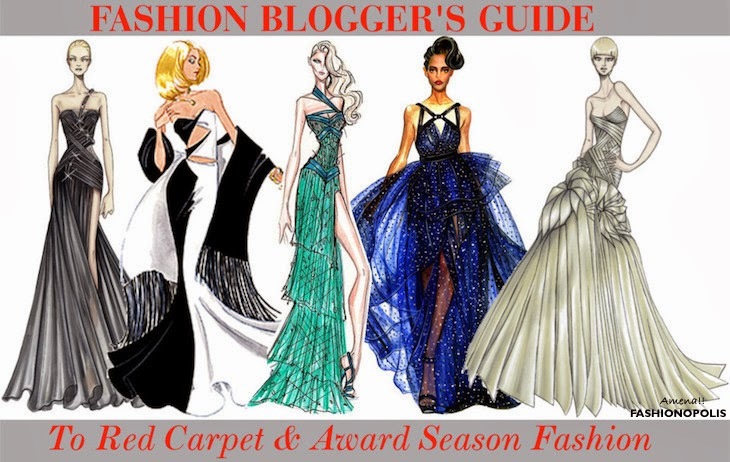 With award season just starting off are you all set for covering award season fashion? I know I am! Share your views in the comment section. P.S: I had previously written a post about how to cover the Oscars. This post is a modified , up to date version of the previous post, with more guideline and coverage suggestions. Some awesome tips....thanks for visiting my blog...like ur page and following u on bloglovin now! Great post, I appreciate you and I would like to read your next post.Thanks for creating this informative post. Number 4 is a great and not so easy tip! Uploading evert single one of the outfits is so tempting! I appreciate you for sharing great and easy tips with your readers. I had great time spending with your blog. Not only for bridal wear, but also for every kind of dress selection, I am going to consider these tips.